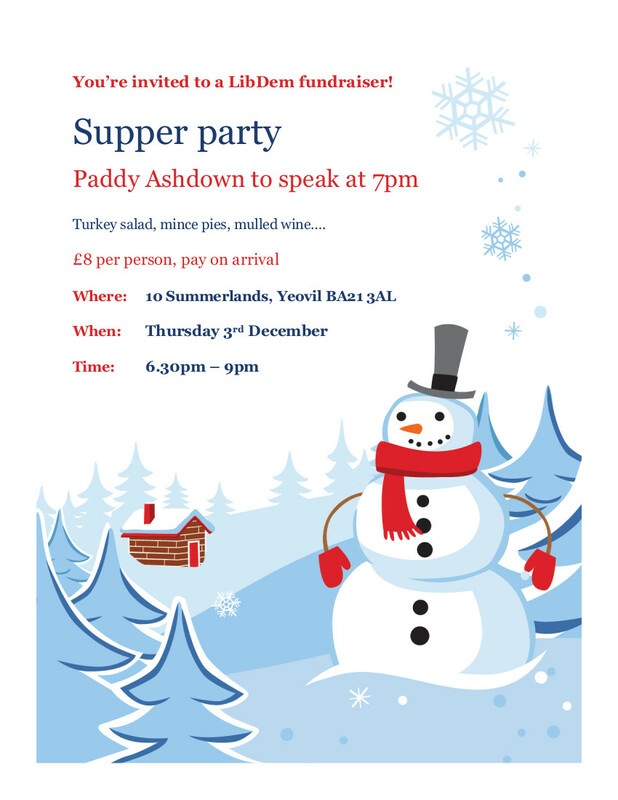 John Clark, SSDC Councillor for Yeovil West, will be hosting a fund-raising supper party at his house on the evening of Thursday December 3rd. When you see how the Conservative government is taking £1,200 a year from 3 million of the poorest workers and slashing programmes to reduce carbon emissions, while giving away inheritance tax breaks to millionaires, it is crucial that the LibDems fight back, and where better to start than Yeovil West! We will be having lots of seasonal food and drink like turkey salad, mince pies, and mulled wine. All included in the ticket price of £8 per person. Do bring a friend or two! Paddy Ashdown will be saying a few words at 7pm, so be sure to arrive promptly at 6.30pm.